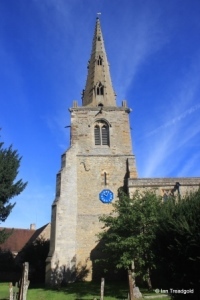 The church of St Mary in Podington is situated in the middle of the village on the High Street running from Hinwick to Wymington. Parking is available in a lay-by outside the church. 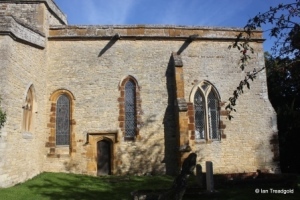 The origins of the church date from the Norman period with parts of the nave showing remains from C12 or earlier. The aisles and much of the church dates from C13 along with the lower parts of the tower. Work in C15 heightened the chancel and aisles and added the clerestory. 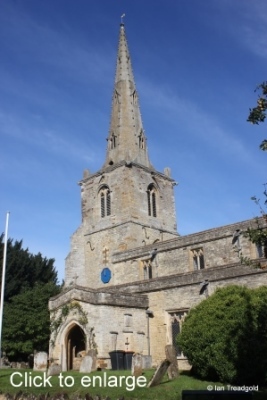 The tower and broach spire dates from late C14 or early C15. Extensive work was need in C19 to the tower which was in danger of collapse and severely cracked. Initial buttress work proved ineffective and the current high diagonal buttresses to the west are the result. The nave and chancel are around 95 feet in length and the steeple some 150 feet high. 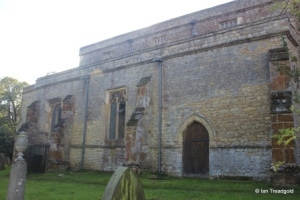 The south aisle has east and west windows along with two to the south. The clerestory above has three square headed two-light windows on both north and south sides. 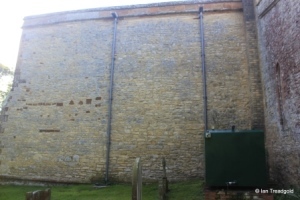 The parapets are plain throughout the church. The east window of the aisle is of modern tracery being of three trefoiled lights under a pointed arch. 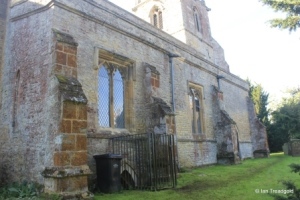 The change in masonry to the right of the window clearing showing the different building periods of the aisle and nave. 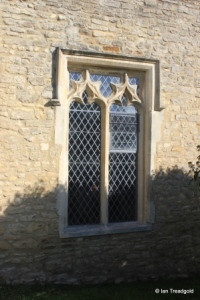 The two south facing windows are both square headed two-light windows with modern tracery in a C14 style. The trefoiled lights are quite wide for the style of window. 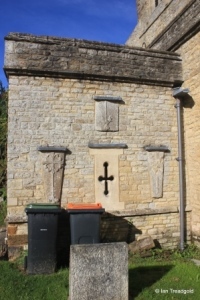 The south porch was rebuilt in the late C19 and has some C13 and C14 coffin slabs built into its east and west walls. 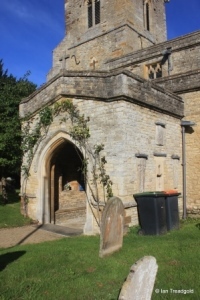 The south doorway itself dates from C15 with a square head and sub-arch with trefoiled spandrels. Above is a plain cross on a circular stone. 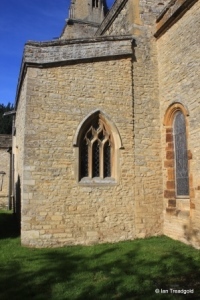 The west window of the aisle is a small modern two light window under a pointed arch again with the clear separation of the aisle and nave visible. 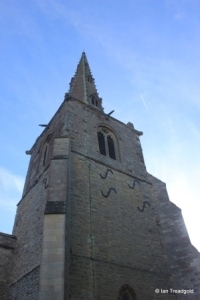 The west tower is of three stages with high buttressing to the west as has been mentioned. The belfry lights are of two cinquefoiled openings under a rounded arch. There is a clock dating from 1859 on the south of the tower. 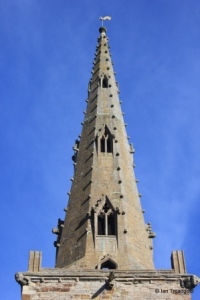 Above the tower, the broach spire has three layers of lucarnes to the cardinal points of the compass. The parapet pinnacles are now unfortunately no longer present, leaving just their stumps. 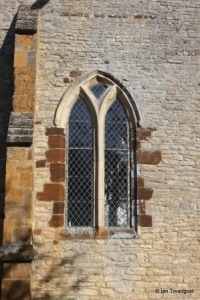 The west window is a single lancet dating from C13 that has been lengthened below the original sill. The upper levels of the tower show the iron bracing added during the works to save the tower in C19. 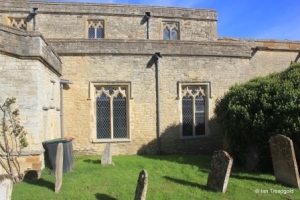 The north aisle, has two windows to the north alongside a north doorway. 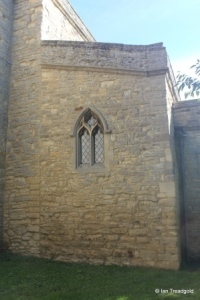 There is also a window to the west and a single blocked lancet to the east along with access down a steep flight of stairs to a crypt. There is heavy buttress work all along the north aisle dating from the C19 restorations. The west window of the north aisle matches its partner in the south aisle. 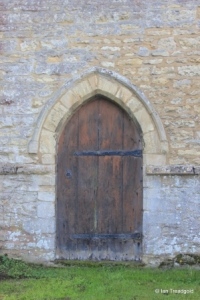 The north doorway dates from C13 with a simple chamfered pointed arch with label above. 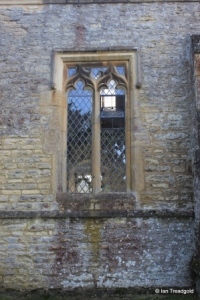 The two north facing windows are both square headed windows of two lights dating from C14 and C15. 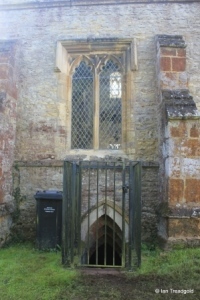 The eastern window is above the steps leading to the crypt. 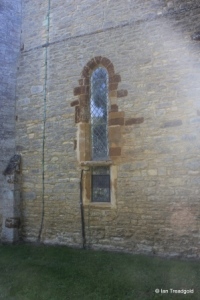 The north wall of the chancel has no surviving windows although there are the remains of a blocked single lancet visible at the western end. 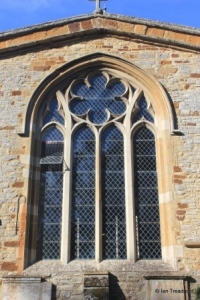 The east window is modern with four uncusped lights with a large sixfoil design above under a two centred arch. 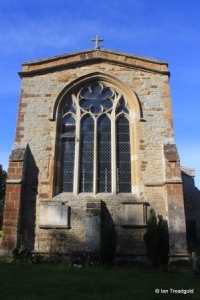 The window dates from 1841 and was designed by the architect Francis Cranmer Penrose whose brother was curate of the church. Francis Penrose went on to become the surveyor of St Paul’s Cathedral. 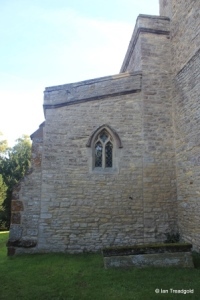 The south side of the chancel has three windows and a doorway. 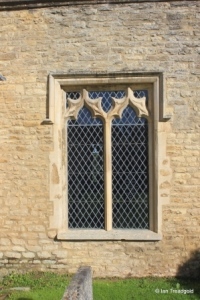 The eastern window is of two plain lancets under a two-centred arch. The western pair are from C13 and are both single lancets, one pointed and the other rounded. 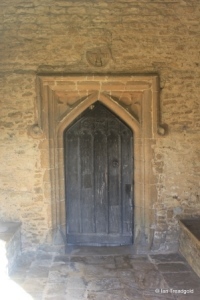 The doorway between dates from C15 with a four-centred arch topped with a square label with trefoil designs in the spandrels. 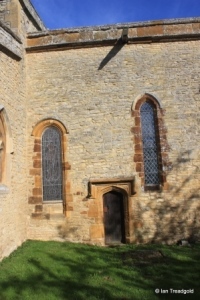 Above the door are the remains of a blocked lancet similar to that on the north side of the chancel.